"Found something on the right," said this Twitter user from Japan, and indeed he has: A logo for the "Nintendo Network," on the box art for Theatrhythm Final Fantasy, due to release on February 12. If it's a new online service from Nintendo, or at least a rebranding of the old Wi-Fi Connection, color us unsurprised. The company's had a number of half-baked ideas about online support but seems to have gotten some traction lately, both with its offerings in the 3DS eShop and the SpotPass service serving the device. 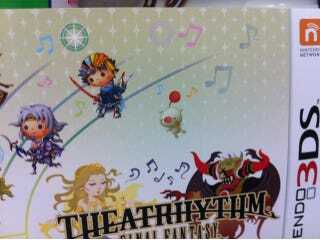 Andriasang notes that the back of the box says the game supports premium downloadable content available via Internet connection, which they say may make Theatrhythm the first 3DS game to use the paid transaction support Nintendo added in a recent firmware update. Update: An overseas (to the U.S.) reader writes to say he's seen references to the Nintendo Network in Mario Kart 7's online menus. I couldn't find them in mine, but what he describes points at a rebranding of the service, rather than something different, and with new features.